A 44 year-old HIV-positive man from Hagerstown, Maryland was found guilty of second-degree assault yesterday for unintentionally spitting on a police officer during his arrest and has been sentenced by Judge Daniel P. Dwyer to five years in prison. handcuffed him and were putting him into a squad car when he spit on Cook, the [probable cause] statement said. “He spit and caught me on the side of my face,” Cook testified. “I kind of lost my cool for a bit,” he testified, saying he pushed the side of Black’s face against the trunk of the police car. Officer William Spigler testified he saw Cook “wipe something off his face” and that Black then tried to spit on him. The officers testified they put a “spit sock” over Black’s head to prevent him from spitting on anyone else. In a 2007 decision by the Ninth US Circuit Court of Appeal, intentionally spitting on someone is "an offensive touching that rises to the level of simple assault,” that can be punished by up to six months in prison. In this case, Mr Black appears to have been charged with second-degree assault soley due to the fact that he is living with HIV. Under Maryland law, a person is guilty of such a charge if they are found to have caused “physical injury” to another person. Physical injury means impairment of physical condition, excluding minor injuries. The maximum prison sentence is ten years and a $2,500 fine. There is no doubt in my mind that a serious miscarriage of justice took place in Maryland yesterday. Earlier this month, the National HIV/AIDS Strategy for the United States noted that "since it is now clear that spitting and biting do not pose significant risks for HIV transmission, many believe that it is unfair to single out people with HIV for engaging in these behaviors and should be dealt with in a consistent manner without consideration of HIV status." 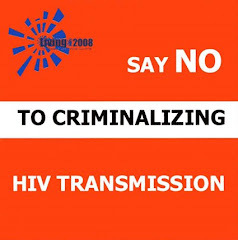 Last week, I presented an analysis of all US arrests and prosecutions for HIV exposure or transmission reported on my blog during a two year period, and found ten similar HIV-related spitting cases. In fact a quarter (21 out of 82) of all cases involved spitting, biting or scratching posing no risk of HIV transmission. The study's title, 'Kafkaesque: A critical analysis of US HIV non-disclosure, exposure and transmission cases, 2007-2009' says it all. Kafkasque is an adjective relating to the writings of Franz Kafka and has come to mean the following: having a nightmarishly complex, bizarre, or illogical quality. What is particularly Kafkaesque about this case is that there were no allegations of intention to infect. Such intent has been used by juries – such as those in Texas – to find individuals living with HIV guilty of attempted murder and other such ridiculous charges. In his opening statement, Assistant Public Defender Robert Sheehan told the jury that the spitting was not intentional. Black’s wife, Michelle Black, testified that her husband often spits unintentionally because he has no teeth. [...] [Assistant State's Attorney] Wilson told the jury that Black’s actions were a “flagrant violation, not only of the law, but of decency.” It was only when he was being booked that Black told police he was infected with the virus that causes AIDS, Wilson said. [...] Black told the officers he had AIDS out of concern for their well-being, Sheehan told Judge Dwyer before the sentencing. [...] Before he was sentenced, Black, who did not testify during his trial, apologized to Officer Cook, telling him he did not spit on him intentionally. In addition, the jury was not told why Mr Black was being charged with second-degree assault for spitting, nor were they told why he was arrested in the first place. Nevertheless they took just ten minutes to decide he was guilty. A Washington County Circuit Court jury took about 10 minutes Monday to convict a Hagerstown man of spitting on a Hagerstown police officer, unaware that the man was HIV-positive. That fact was revealed in court when Judge Daniel P. Dwyer sentenced Jeffrey Lynn Black, 44, of [man's address] to five years in state prison for second-degree assault. [...] Assistant State’s Attorney Brett Wilson said before the trial started that two malicious destruction of property charges against Black were being dismissed. Following a bench conference prior to the trial beginning, Wilson told the officers who were to testify that they could not mention why Black was taken into custody or that he had an infectious disease. Adding to illogical aspect of the case, Officer Cook erroneously believes that he remains at risk of seroconverting and must be tested for HIV every three months for a year. “It’s on my mind ... every three months I have to go back and get tested,” said Officer Richard Cook, who told the judge he will have to be tested periodically for at least a year. Finally, Mr Black's lawyer had asked Judge Dwyer to delay sentencing because his client is “very sick. It’s possible a jail sentence could, for all intents and purposes, be a death sentence,” he said. Judge Dwyer ignored his plea. Daniel P. Dwyer has been an Associate Judge of the Washington County Circuit Court, in the 4th Judicial Circuit, since April 3, 2009. Judge Dwyer is standing for election on November 2nd for a 15 year term on Washington County Circuit Court. He can be contacted at 240-313-2550.